After a disappointing 5-7 season, Kliff Kingsbury could be the jolt that the USC program badly needs. Antonio Morales (TheAthletic.com) — LOS ANGELES — After this past season, USC’s offense needed something. The offense lacked identity, a clear vision, consistency, and as of last week, when Tee Martin was relieved of his duties, a coordinator at its helm. On Tuesday morning, a major move was made in an attempt to remedy all of that. 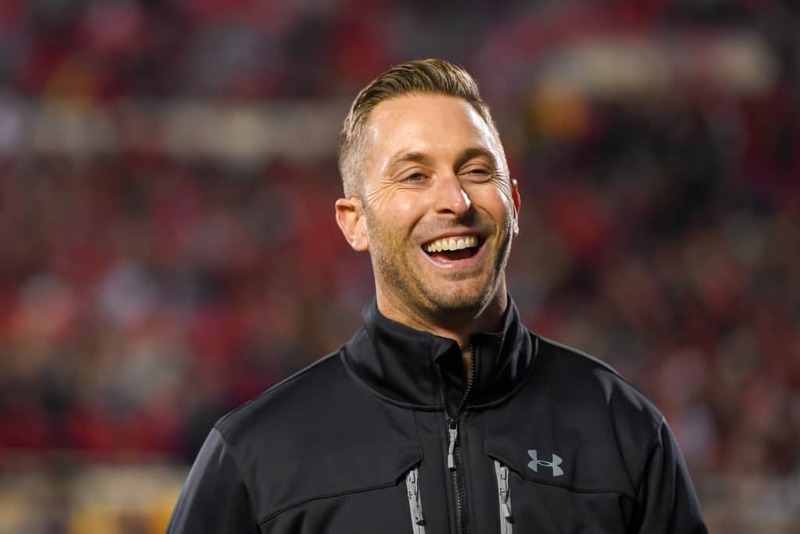 That’s when The Athletic’s Bruce Feldman reported the university and former Texas Tech coach Kliff Kingsbury reached an agreement, after about a week of speculation, for Kingsbury to become the Trojans’ next offensive coordinator. 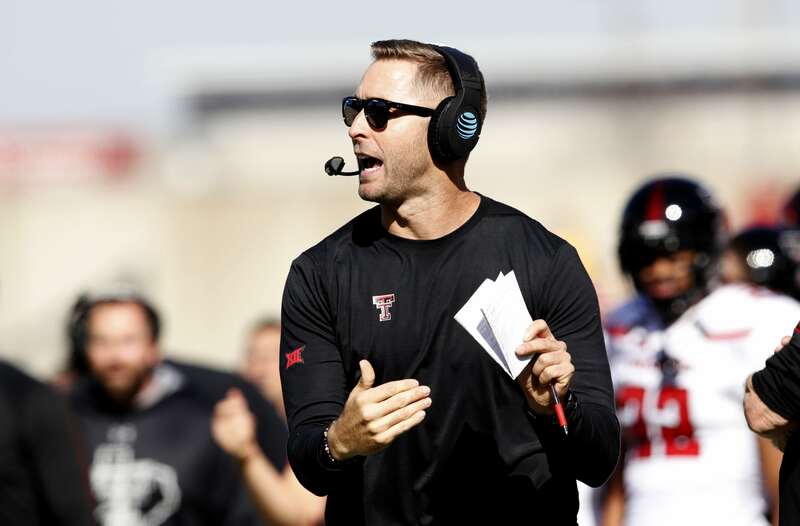 Kingsbury, who is viewed as one of the most innovative offensive minds in the sport, is fresh off a six-season stint with the Red Raiders, who were 35-40 in his time as their head coach. He played collegiately under Mike Leach but has developed his own spin on the “Air Raid” offense as Texas Tech’s coach and during offensive coordinator stints at Texas A&M and Houston this decade. Kingsbury’s task is simple: breathe new life into a USC offense that performed well below expectations this season. The Trojans, who went 5-7 and posted their first losing season since 2000, averaged 26 points per game, which was 91st among 130 FBS programs and their lowest scoring average since 2001. USC’s average of 5.78 yards per play was its lowest this decade. Given the amount of four and five-star prospects on the roster, the performance was a massive disappointment. Considering the offensive personnel on USC’s roster, a marriage with Kingsbury’s prolific offense plays to the Trojans’ strengths. Kingsbury coached several talented quarterbacks during his time at Houston, Texas A&M and Texas Tech. Baker Mayfield, Patrick Mahomes, Johnny Manziel, who won a Heisman while Kingsbury was the Aggies’ offensive coordinator, Case Keenum and Davis Webb — who all went on to the NFL — have all played for Kingsbury within the past eight seasons. At USC, Kingsbury will inherit a former five-star prospect with a season’s worth of starting experience under his belt in JT Daniels. There are plenty of good receivers at his disposal as well. Michael Pittman Jr., a 6-foot-4 target, led the team with 758 receiving yards and will ask for an NFL draft evaluation but plans on returning for his senior season. Amon-Ra St. Brown led the team with 60 receptions (for 750 yards) as a true freshman this season. Redshirt sophomore Tyler Vaughns caught 58 passes for 674 yards and tied Pittman for the team led in touchdown receptions with six. Over the years, USC has gotten further and further away from “Student Body Right” and the traditional power running game it had a reputation for utilizing decades ago. As Lane Kiffin and Steve Sarkisian went through their tenures, more spread concepts were adopted and Helton, who served as an assistant under both coaches, has continued that. In Helton’s three seasons, the Trojans have been fairly balanced, passing the ball on 49 percent (2016), 50 percent (2017) and 54 percent (2018) of their play. Kingsbury’s offenses at Texas Tech relied much more on the pass. Texas Tech passed the ball 57 percent of the time in 2017, which was its lowest percentage in Kingsbury’s six seasons, and on 58 percent of its plays this past season. Since 2013, Texas Tech picked up 73 percent of its total yards through the air, the second-highest rate in the FBS over that span behind only Washington State. Under Helton, USC has picked up 61 percent of its total yards via the pass, 45th in that span. It’s difficult to imagine USC just forgetting about the run, though, so it will be interesting to see how much Kingsbury’s offense can mesh with the Trojans’ stable of running backs. Washington and Utah played for the Pac-12 title on Friday night. Both offenses’ strong points were running the football. When USC won the Pac-12 title in 2017, it had Sam Darnold, but it also had a quality running back in Ronald Jones to provide balance. Stanford won the Pac-12 behind the talent and explosion of running back Christian McCaffrey. Texas Tech’s and USC’s offenses varied in other ways, too. The Trojans utilized a tight end on 91 percent of their plays last season — per Sports Info Solutions — while the Red Raiders lined up with a tight end on 25 percent of its snaps. Kingsbury utilized a lot more four-receiver sets. Texas Tech attempted 365 passes out of four-receiver sets this season — also per Sports Info Solutions. USC attempted 50. The tempo is also vastly different. In Kingsbury’s tenure, Texas Tech ran 82 plays per game, which led the FBS over that period. During Helton’s tenure, USC has run 72 plays per game, 45th in the FBS. It worked for Texas Tech’s offense, which in Kingsbury’s time in Lubbock averaged 37.8 points per game, but that kind of tempo could put more pressure on USC’s defense, which will lack depth in the secondary next season. But, to be frank, this was the kind of hire Helton needed to make. The offense sputtered last season, the team lost games and the fans lost interest. No more than 59,821 people attended a game at the Los Angeles Memorial Coliseum this fall. Some of the fans who did show up booed Helton when a video of him thanking them for their support was played on the video board. This is something that can revitalize an offense and a fan base that’s used to exciting football. It should also pay dividends in recruiting for USC, especially when two of its most crucial remaining targets are five-star receiver Kyle Ford and five-star athlete Bru McCoy. it will be interesting to see how everyone adjusts to this. No way KK sits around asking how he should do his job or what he needs to do in practice. I assume his offense will practice fast as that is the way they play. Our defense will have to practice the same way. Should be interesting in a how good can this be kind of way. That’s so much more fun than what we have been, interesting in a how bad can this get way. What will his impression be of the O-line? That will be a very big question. Is USC going to make an official announcement and introduce the new OC? No doubt. i LIKE Fink AS WELL. I remember him from youth league in Arcadia. Always the fastest kid on the field. I do like them both Sears and Fink. I Want all the kids to do well. However Sears passes the eyeball test to me. Fink is next. Daniels just does not look like “THE GUY” to me. From where I sit It’s Sears 1 / Fink 2 and Daniels 3. Give me the older kids who can stick and move. So 75 games and 2835 points — about 38 points per game. Now we just need Clay to stay out of KK’s way and hopefully we’ll have a good offense next year assuming we can find a good OL coach. KK’s gonna be great. Book it. It’ll be interesting to see the overall effect he has on the USC staff in general as the new big cheese. KK’s the man and everyone knows USC had to get him over the types of opportunities none of these USC staff members have ever experienced. Maybe he’ll somehow affect the practicing deficiencies as viewed by many. That part’s all speculation on my part, but one can hope, eh? You think he gets paid more than CH? Perhaps SC can hire better position coaches now that KK has been hired, instead of settling for coaches with very little experience. Wonder if KK will want to pick his own QB coach and O line coach? KK will be his own QB coach, or at least he should be. I always figured he could be a two-for-one deal. just another reason we had to get him! That’a just Yogi Roth’s opinion. That doesn’t make it true at all. I’m sure he doesn’t want to offend Clay Helton. They’re buddies in L.A. The only people who really know what KK’s total powers are would be Swann, Helton and KK. we will see. We have all had a lot of Kool-Aid sent our way the last couple of years. I am just a little reluctant to take another big swallow. I agree Allen, and I think Swann is in agreement also, I think he wants an offense that works, and the USC offense does not work. We will see new formations, motion, isolation, and when that works the run game gets opened up with the box opened. For sure we cannot see Helton calling plays, he needs to stand there like Saban does. Really good to get some positive news for a change. I think Yogi’s last comment about the need to be more disciplined, physical and consistent is spot on. I hope Helton doesn’t screw this up. Agree to all, but who is going to make these changes? Helton has proven that he can’t. But he does like to watch a lot of film. So KK scored a lot of points, but his teams gave up more than they gained as reflected in his overall losing record. But it being Texas Tech, I guess the guy gets a free pass. KK doesn’t coach defense. His record as a HC is totally irrelevant. All that matters is how he coaches offense and calls plays.